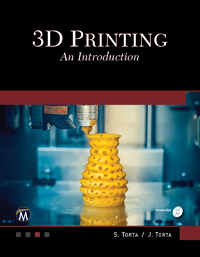 This book is designed as an introduction to the field of 3D printing. It includes an overview of 3D printing technology in industry, education, and the exploding area of Do-It-Yourself. It contains a detailed look at the common 3D printers, materials, and software. Using full-color images throughout, the book guides you on setting up your own printer and performing calibration tasks, including descriptions of printing methods, best practices, pitfalls to avoid, and how to finish a completed project. Divided into three parts, the book covers a brief history and evolution of 3D printers, along with their use in industry and in personal consumer use in Part 1. Part 2 gets you started with the set up and use of a common 3D printer, from initial hardware and material calibration and safety, to how the software functions work, and how to acquire 3D objects to print. It then showcases three different projects from start to finish. Part 3 concentrates on buying your own printer, the common features of personal 3D printers, and includes sections for the adventurous on post-market modifications. Companion files are included with videos, applications, and examples of 3D printing. 1: A Brief Overview of 3D Printing. 2: 3D Printer Use in Industry. 3: 3D Printers and Education. 4: Do-It-Yourself 3D Printing. 5: Types of 3D Printers.6: Printable Materials Including FDM Filament. 7: Applications and Slicing Settings. 8: Getting Started. 9: Setting Up to Print. 10: Calibration. 11: Buying and Calibrating Your Filament. 12: Challenges. 13: Refining and Finishing the Print. 14: Buying and Modifying Your Printer. 15: Maker Minds. Appendices. Index. Stephanie Torta is a Senior Media Developer and an accomplished graphic designer, videographer, and photographer with over twenty years' experience including teaching graphic design at Boston University and Emerson College. Jonathan Torta is a lifetime DIY enthusiast constructing various automated devices, computers, Tesla coils, and robots, with over 8 years constructing and modifying a variety of 3D printers to maximize their capabilities.